45041 powers away from Norden towards Swanage. The high vantage point is provided by the National Trust's Corfe Castle. 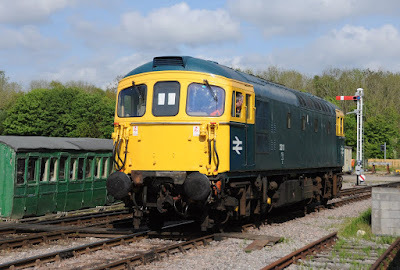 The Swanage Railway is without doubt one of my favorite preserved lines in the UK and each May is host to arguably one of the best diesel galas in the country. This year was of course no exception and I headed down on the Friday to sample the action. 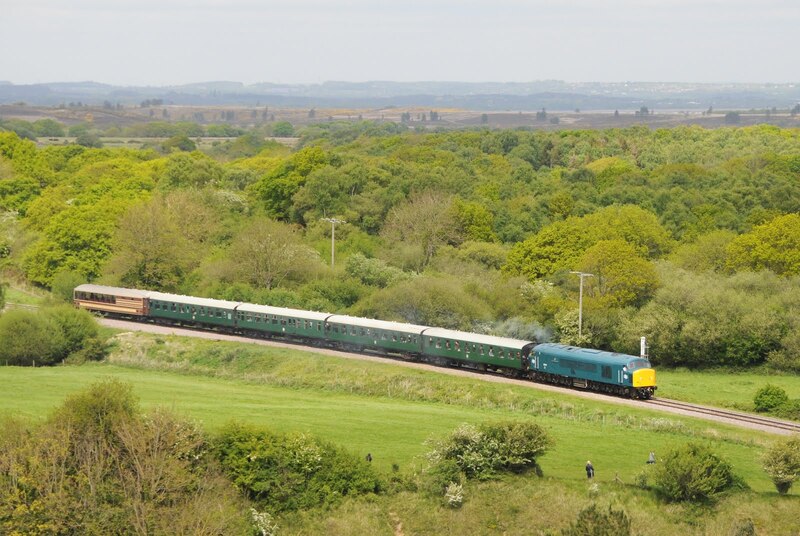 Eight preserved locos took part this year from the home and visiting fleets, Class 20's D8059 and D8188 joined 26043, D6515 (33012), 33111, 45041, Class 47 D1842 and 50026. 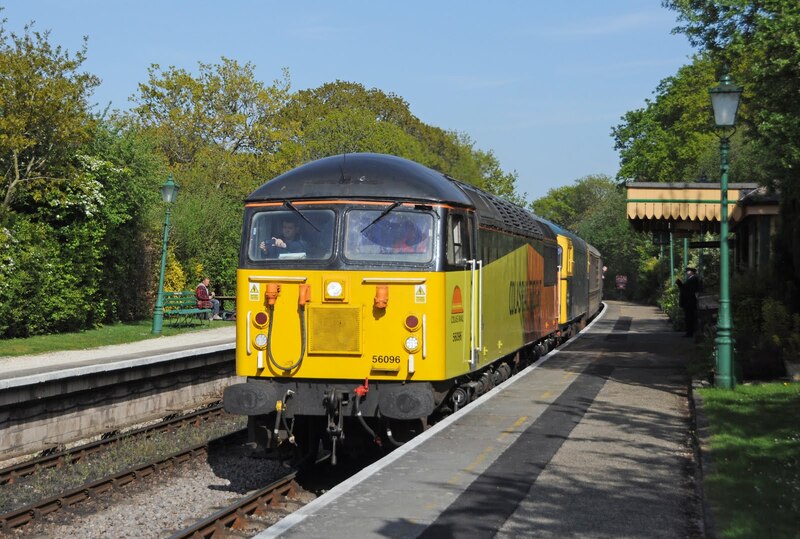 Four further visitors were sourced from main line operators with GRRf sending 73119, 73961 and 66741 and Colas sending 56096, one of the major highlights of this years line up. 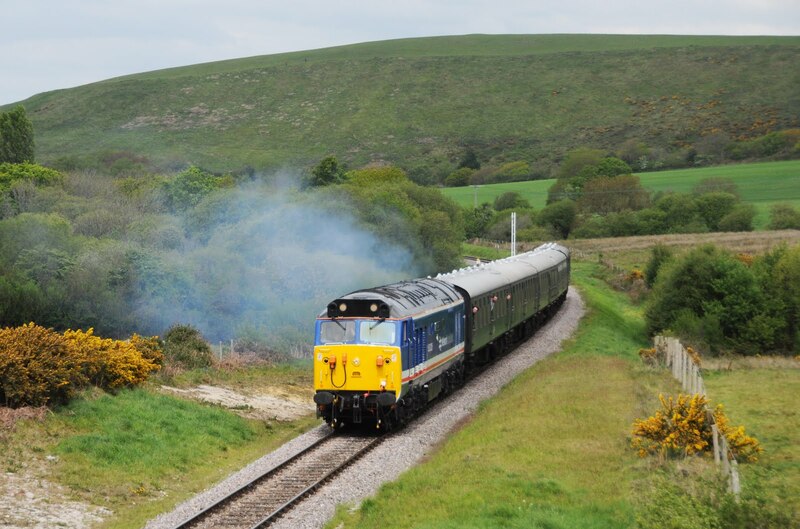 50026 'Indomitable' between Corfe Castle and Harmans Cross. viewed from Corfe Castle heading towards Norden. 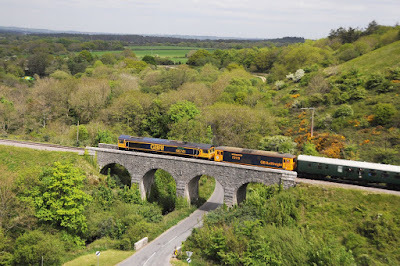 With 9 locos in action (one class 33 each day worked driver experience trains north of Norden) there was a lot to cover however as always I had a very enjoyable day on the trains and despite the weather being somewhat overcast at times got a good selection of photographs. The diesel gala is complimented by a beer festival at Corfe Castle and of course the stunning Purbeck scenery. From late summer the Swanage Railway hopes to begin running scheduled heritage diesel services through from Swanage to connect with the main line at Wareham. 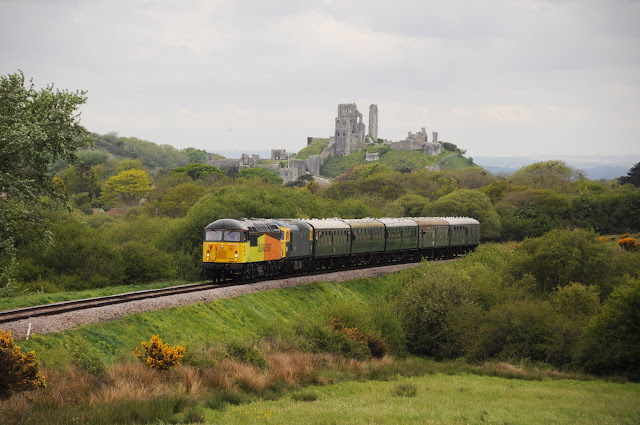 56096 heads towards Swanage with the remains of Corfe Castle dominating the skyline. 56096 visiting from Colas Rail arrives at Harmans Cross with a service bound for Norden. 5/5/2017.